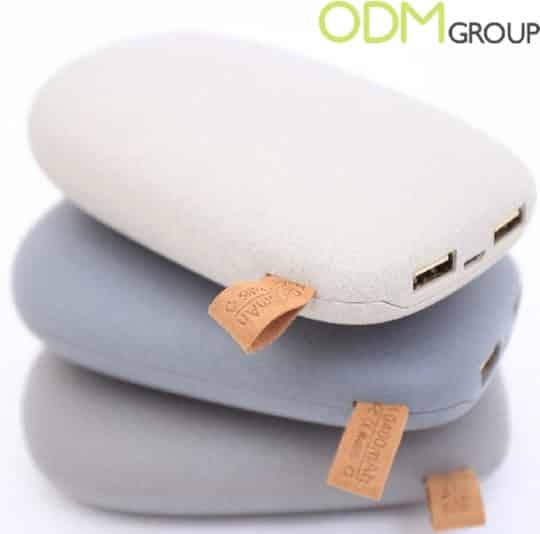 Power banks are portable chargers and come in different designs, making it a good idea for your next marketing campaign! If you are planning your new marketing budget for this year, perhaps, a good idea for you is to pay attention to these cool and innovative designs for promo power banks. Today there is a continual growth of mobile phone abilities and software, and that’s why gadget owners face the problem of needing to charge it more than once a day. Considering the role of mobile phones in our lives, we are dependent on the smartphone charging level. It often happens that mobile phones switch off exactly in the moment they are highly needed, for example, when you want to take a photo of a memorable event or answer an important call. So with these cool promo ideas you can forget about this problem for goods. Summer will pass quickly and autumn will come. This amazing power bank will take care of your mobile phone charging level and of your cold hands as well. Just turn this promo idea on and enjoy the warmth in your hands. This multifunctional device is a great promotional product. Your customers will be full of gratefulness to your brand while this branded product will warming up their hands and hearts, by charging their mobile phones at the same time. The appealing design will also build customers loyalty up and attract lots of attention. Such a fancy idea for nature lovers. This smart promo power bank has a unique and very appealing design, and a special label makes it even more stylish. Besides this, it has two connection slots, meaning that your customers will be able share it with their friends and relatives, to charge their portable devices. Therefore you can expand the increasing of your brand awareness as this custom power bank can be used by more than one person at the same time. In addition, this power bank is equipped with three levels of protection. There are over-charging protection, short-circuit protection and overheat protection. That’s why your customer will be happy to use as it is really high quality promotional product. What a cute marketing idea. 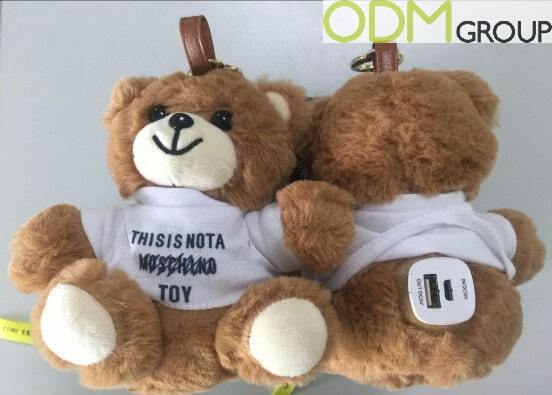 By offering these charging teddy bears you can uphold your brand reputation because it cheers your customers up every time they use it. This promo idea is not only a cute promo plush toy but also a power bank and promo keychain, so it is very convenient to take it with you. This innovative promotion will catch people’s eyes and they would like to have this too, in this case you can attract new customers and increase your sales. This is a good idea to target families with kids, because young consumers will for sure love these teddy bears when they see them at the shop or anywhere at your POS stand. New technology is developing fast, and in this case we suggest you to make your brand more modern in the eyes of your potential customers. This promotional idea can turn ordinary power banks in something more innovative and exuding. 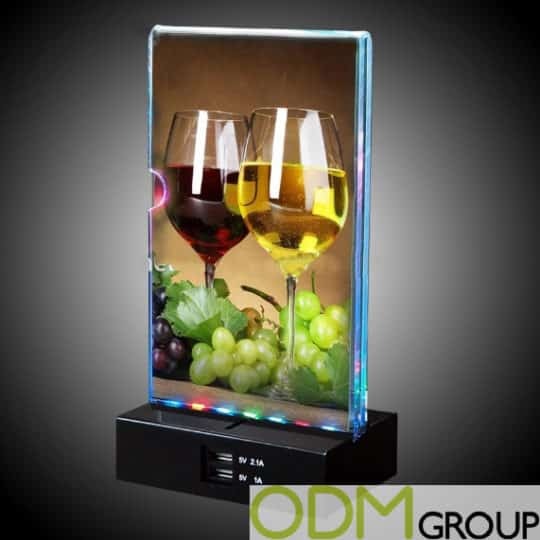 The main advantage of this marketing gift is the LED lighting on the front. Due to this opportunity your brand will be illuminated even in the dark. 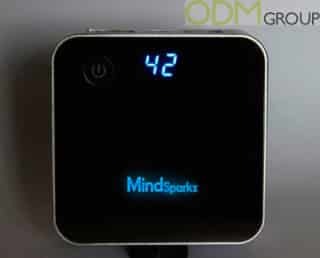 This power bank has also one important distinction compared with others – due to LED lighting your customers can see the percentage of battery power left. Therefore you can make your brand stand out of the crowd with this innovative idea. Of course we can’t pass by this great idea for restaurant, bars and other public institutions. Thanks to this LED menu power bank you can attract those who can’t leave their mobile phones even during lunch. This promotional item is a menu holder with surrounding colorful LED light and has the ability to charge mobile and tablet devices. Therefore your visitors can enjoy your dish without even not looking up from their mobile phones. That’s why it is a great promo idea to attract more visitors, because you can expect the power of word mouth advertising. Mobile phone dependent visitors will be likely to highly recommend your bar or coffee shop to their friends thanks to these LED menu power banks. 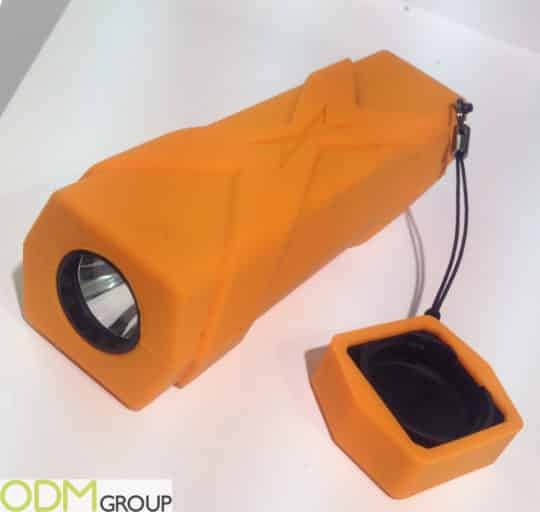 What about the power bank idea for active leisure equipment producers? Of course a power bank itself is a really necessary item when you are going camping or hiking just because it is the only one product which will be able to charge your mobile phone without electricity connection and sun power. But also this is a promo torch, one more thing you need during camping. With this marketing idea you will kill two birds with one stone. Customers will highlight your brand as being a more competitive brand among others. Offering 2 in 1 items is always good idea, but sometimes customers use only the one function of multifunctional item. In this case there is nothing superfluous in this torch with power bank, a truly useful and smart product. If you like any of these promotional power banks you can contact us, and our sales team will provide you with more information. 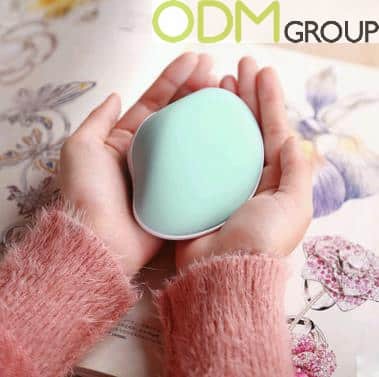 Here at the ODM Group we have significant experience in sourcing, designing and manufacturing that’s why you can rely on our professional approach to your next promotion.